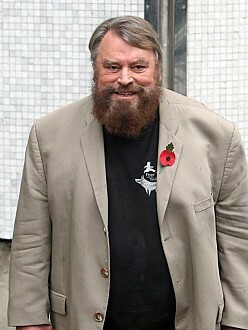 Brian Blessed‘s dog ate his Best Actor award. The Flash Gordon star won a bizarrely-shaped prize of a bone sat on top of a rock at the Tenerife Film Festival for his role as George Mallory in 1991 TV movie Galahad of Everest, and when he got back home his pet pooch took a big liking to it and had it for dinner. While the 79-year-old star’s crafty canine made a dogs dinner out of his award, Brian insists he rarely thinks about being recognized for his work. One achievement the comedy actor – who played Prince Vultan in Flash Gordon – hasn’t won any silverware for just happens to be his proudest ever accomplishment – going to the magnetic North Pole. The star loved it so much he’s going to attempt the expedition again in 2016 at the age of 79.